Recently, we've talked a lot about the improvements you can find in the new version of Paltalk, from upgraded Whisper visibility and customized highlighting to Zoom Text and Video Filters, all available free with download. But maybe you're a long-term member who has invested not only your time but also your hard-earned cash into our product. Your nicknames are iconic, your Pal lists impeccable. You aren’t looking for sleek and shiny. You're looking for value. The all-new Paltalk is perfect for you, too. While our teams were building the all-new Paltalk, they thought very hard about how to give our members the best value for their purchases. That’s why it’s so much easier to share your swag with the rest of your Pals. Crowns, subs, and gifts all feature much more prevalently in the all-new Paltalk. Members using Paltalk Classic only get to show off their crowns in the members list of a room or in the background of a private chat. With the new Paltalk, your hard-won crowns appear in room members and Pal lists; under your status name (at the top of your window); and next to your text in room and private chats. In Paltalk Classic, Flair displays next to your nickname in the room members list. 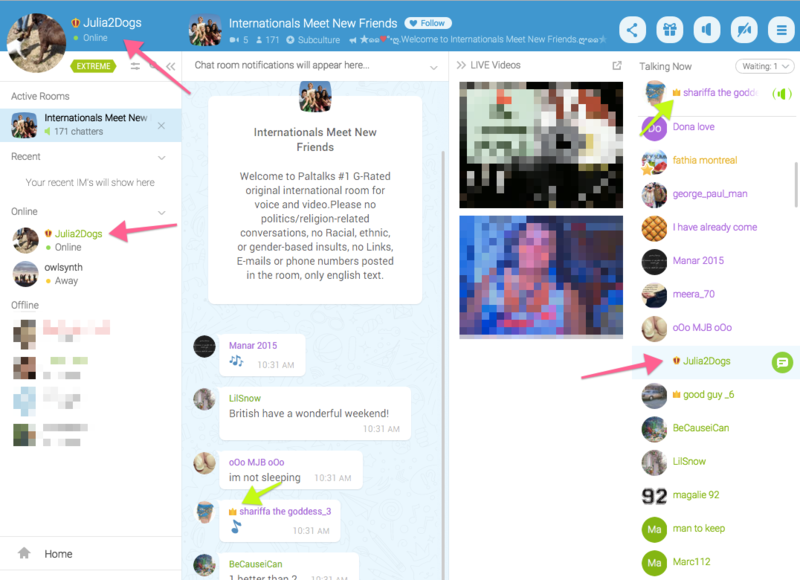 In the all-new Paltalk, your Flair appears almost anywhere your nick does: room lists, direct chat messages, your status name, and Pals lists. Show that little guy off to everyone! You’ve been able to see Virtual Gift activity on your web profile for a long time, but did you know that the all-new Paltalk helps highlight your generosity even more than Paltalk Classic? Any time you send a Virtual Gift to a room, it appears in the Room Alerts bar at the top of the chat stream, as well as in the chat stream with a full image of the Gift. Plus, send a really big gift (1000 credits or greater), and you and your recipient (room or Pal) are treated to an animated announcement splash to celebrate. No more good deeds getting lost in a flurry of messages! Paltalk Classic highlights subscription level in chat streams and in room members lists. However, the all-new Paltalk prioritizes your subscription status, featuring your nickname in the corresponding color in chat streams, room and Pal lists, and in private chat messages. Stay tuned for more exciting developments in this area soon! Download the all-new Paltalk today and check out what it's like to be the popular kid in the room! You can find out more about Paltalk, new features, and promotions by following us on Facebook and Twitter!